The ZiS-30 came to be in 1941, because the Soviets lacked everything but manpower to fight the war. They desperately needed tanks, but especially AT vehicles in order to halt the German advance which was gaining ground as a result of their superior armored divisions. Under the direction of P. F. Muravyova at Plant Nr. 92, a special team came up with the idea of mounting a gun onto a tractor in order to create one of the many improvised Soviet tanks of WWII, which would hopefully help to stop the ferocious German onslaught. 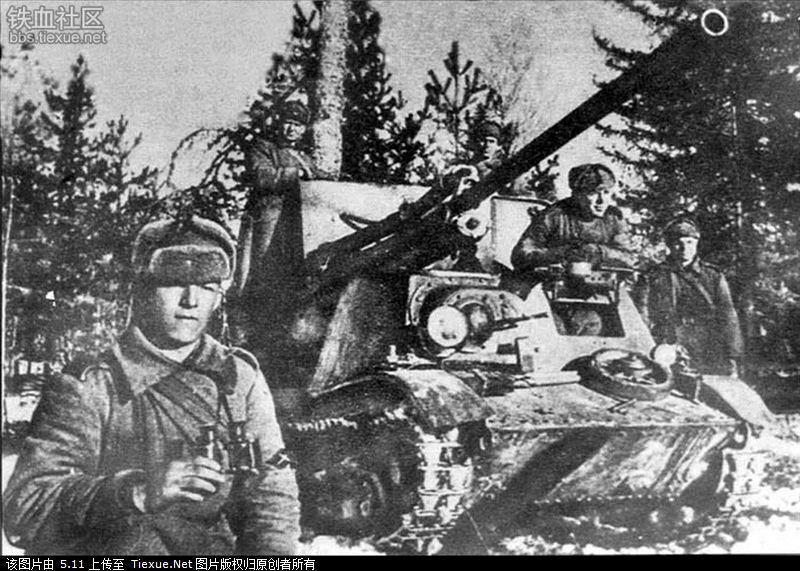 This particular tank had some more substantial combat success compared to other improvisations such as the NI and KhTZ-16, and is perhaps the most well-known improvised vehicle of the war. Despite relative fame, it must be remembered that even the most optimistic among the Red Army leadership had to admit its many shortcomings. A ZiS-30 with its crew. 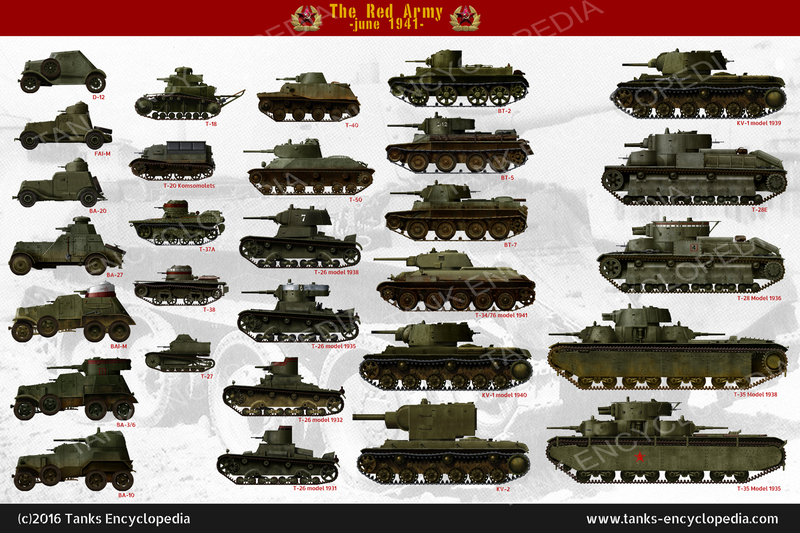 The first few weeks of the war saw the greatest need for the Red Army to have mobile AT and AA vehicles. As a result, on July 1st, 1941, People’s Commissar of Arms, Boris Vannykova issued desperate measures to three different weapons producing factories. These factories were ordered to take the weapons that they produced and mount them onto a chassis of some sort – Plant Nr. 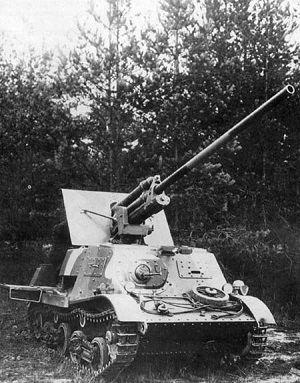 4 (ZiK in Sverdlovsk) made a 37 mm (1.46 in) AA gun, Plant Nr. 8 made an 85 mm (3.35 in) AA and AT gun, and Plant Nr. 92 (ZiS in Gorky) made a 57 mm (2.24 in) AT gun. 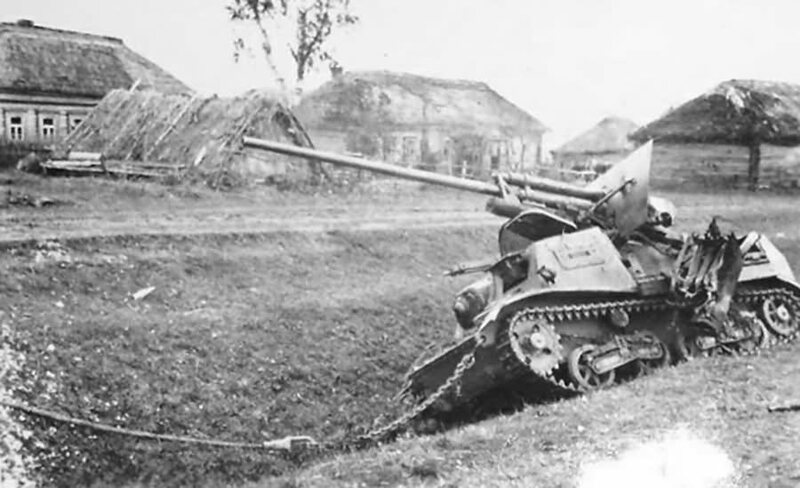 The idea was for these plants to turn available vehicles, such as artillery rough-terrain transporters or crawler tractors, into makeshift tanks by fitting them with an armored cab and their respective guns. Projects were to be submitted by 15th July 1941 in order to be inspected. This deadline was far too ambitious. Plant Nr. 92 (ZiS) proved to have the best design, but it came late. They had a special team led by P.F. Muravyova who oversaw the intensive work, but they missed the deadline. In late July, two vehicles were produced and they were presented at the factory gates – the ZiS-30 and ZiS-31. 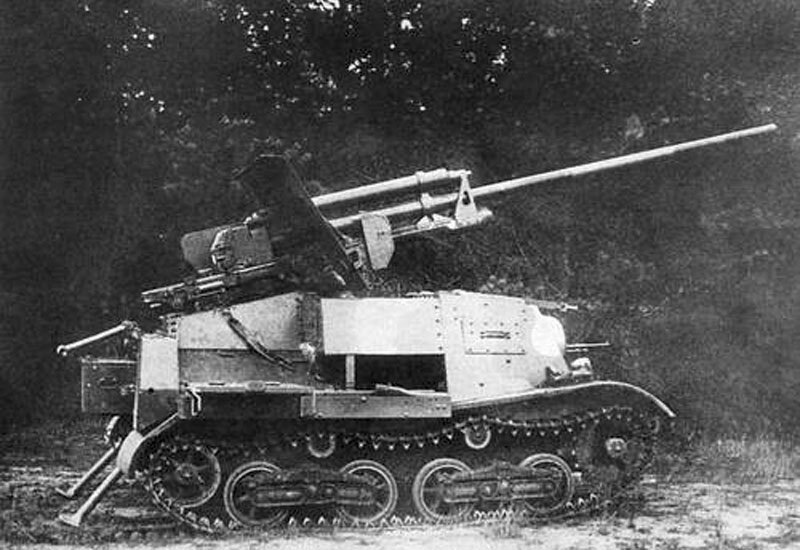 The first featured the ZiS-2 57 mm AT gun (the same as was installed on the A-20 prototype) mounted on a Komsomolets tractor. 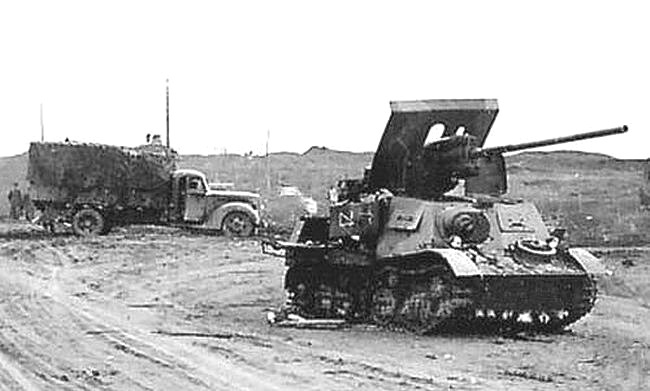 The second vehicle used the same ZiS-2 gun but was mounted on a GAZ-AAA truck. Comparative tests conducted in July and August showed that the VMS-31 truck was more stable and had higher accuracy compared to the VMS-30 tractor, but the VMS-30 tractor was more weather-resistant and had better off-road capabilities. As a result, the VMS-30 tractor was accepted into production under the designation “ZiS-30”. On September 1st, 1941, Plant Nr. 92 was meant to start mass production, but there was a huge problem. Plant Nr. 37 in Moscow, the sole producer of the Komsomolets tractor, switched to tank production in August, and ZiS-30 production in Plant Nr. 92 could not begin without a sufficient supply of tractors. Therefore, the factory was only able to take tractors that had come from the front line. Due to this delay, production finally started on 21st September. 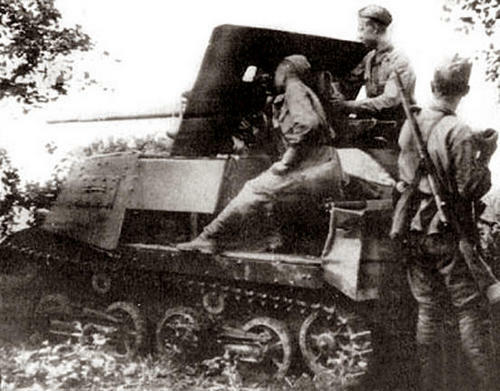 A rear view of a ZiS-30 and its crew operating it. By October 15th, 1941, the plant manufactured 101 ZiS-30s, and the prototypes, VMS-30 and VMS-31, were reportedly sent out to fight also. To balance the gun on the precarious chassis, a spring mechanism was fitted and sights were also mounted on the gun for direct fire. The gun could fire up to 25 rounds per minute in theory, but including aiming, this only effectively reached 15 rounds per minute. The DT machine gun in a ball-mount was kept from the Komsomolets and was, of course, mounted to the right of the driver for engaging infantry. After October, the lack of tractors meant that the factory had to improvise once more. 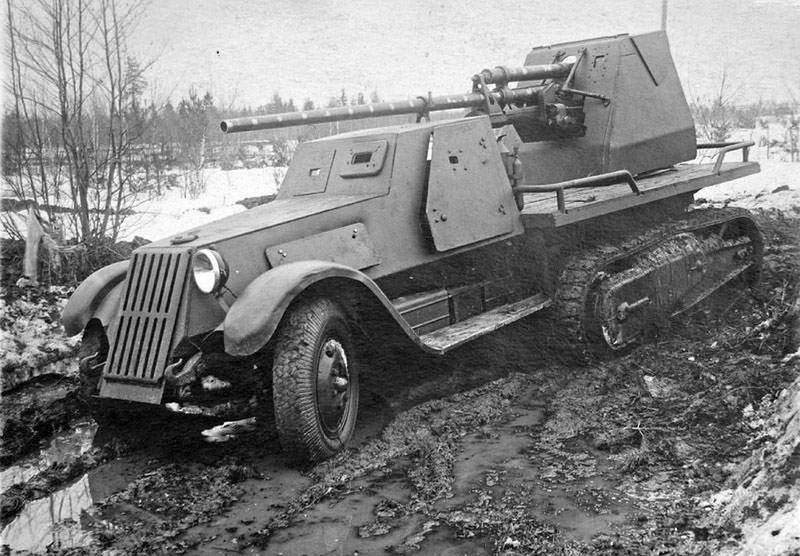 They looked into taking the ZiS-22 half-track vehicle and fitting an AT gun to the back. One prototype was built and tested in November 1941, called the VMS-41, and it showed good results. However, there were problems in producing of the 57 mm ZiS-2 gun due to the complexity of the gun’s long barrel and high overall cost. They would not be able to make a sufficient number of VMS-41s, and after this realization, all work was dropped the same month. The first batch of ZiS-30s was handed over to troops in late September 1941. They were sent to the front in armored brigades to the west and south fronts. In their first battles, it was said that they fared well. The Chair of the Central Committee of Artillery Administration (GAU), E. Satelya, described their deployment as “successful combat“. However, this may only be relatively speaking for an improvised tank. Many of these tanks appear to have been used for ambush attacks and were camouflaged with paint in various patterns. One of the more common camouflages was a simple white for winter conditions, but some three-tone summer camouflages were applied. By summer, 1942, almost all of the ZiS-30s that were produced had been destroyed. Some were lost in fighting, and some just broke down beyond repair. A knocked out ZiS-30 in a rural village. ZiS-30 in the Moskow sector, December 1941. A clear view of the ZiS-30 with camouflage painted onto it. 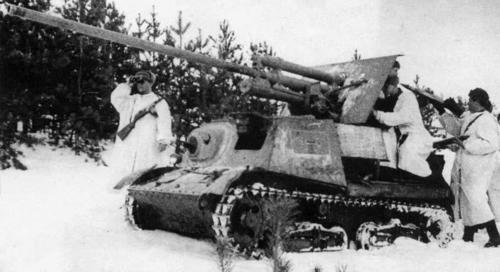 A ZiS-30 in winter camouflage. 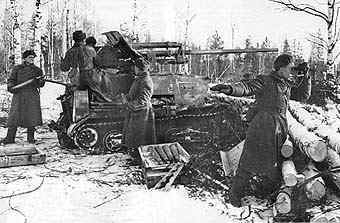 Another ZiS-30 being operated by its crew, possibly during an ambush attack. A clear view of the ZiS-30 in profile. The VMS-41 prototype. It would have also featured a DT machine gun next to the driver, but it is not mounted in this photograph. Another knocked out ZiS-30 as part of a column.